Our engagement in the esoteric process does not require a belief in reincarnation, nor does it require a belief in any doctrine or dogma. It is, however, guaranteed that during one’s process, personal encounters with past-life scenarios will provide one with the personal experience, and therefore, knowledge of reincarnation as an esoteric principle. Basically, reincarnation is a cyclic process of birth, death, and rebirth, as represented by the Rune Bhyūso. The Hindus claim that the Aryans from ancient Tibet conquered the Indus Valley and established the culture, religion and the Sanskrit language, leaving them with the principle of reincarnation. A researcher by the name of Edred Thorsson pointed out that our Indo-European ancestors in Scandinavia used the Old Norse term of “Aptrburdhr” for reincarnation. This is pronounced like: “af-tru-bur-ther” with the rs trilled. As Ron McVan pointed out in his book entitled “Creed of Iron”, the ancient Aryan symbol of the triple spirals symbolized the womb, death and rebirth. These spirals appear all over Europe on sacred places of worship, entrances to caves, and on megalithic monuments. Those who think that a belief in reincarnation necessarily negates the reality of Valhalla, fail to understand that our people require a place to exist together between lifetimes, and that Valhalla is a part of that astral structure. Actually, a non-belief in reincarnation is strictly a Christian belief. All people in ancient times, both pagan and Christian alike, understood the principle of reincarnation. The first time it was forbidden by law, was in 558 C.E. (A.D.), when the Second Council of Constantinople declared the concept of reincarnation to be heresy. Therefore, this non-belief is specifically a Catholic thing; but by the time of the Protestant Reformation, it was so ingrained, that no one thought to question the matter. For this reason, although there is no scriptural reference denouncing reincarnation, all Christians across the board denounce it without question. So the question stands, then, as to why the Christian Church would banish such a concept in the minds of people the world over. What is it about this principle that would cause anyone to replace it with notions of a life consisting of only one chance to find the only truth that exists in the world, in order to avoid eternity in a fiery, burning hell? First of all, organized religion was given to us for the purpose of mass control on Earth. How can the people be made to comply with religious dogma that the world has never before heard of, except by the threat of such eternal punishment; especially if they know that they have another go-around coming in order to eventually get it right? Secondly, the way in which reincarnation works in this world is not the same as the way it works throughout the rest of the universe. For us, it has become a trap, and those with esoteric knowledge and wisdom figured out that trap long ago, which is one of the many reasons they were destroyed in the so-called “Great Inquisition”. The banishment of reincarnation as a principle of learning and study, effectively prevented the world in mass, from discovering the true nature of that entity named Dominion, who made himself the god of this world. Occultists know him variously, as Jehovah (Christian), Dominus or Domine (Latin/Christian), YHWH or JHVH (Hebrew), Yahweh (Jewish/Christian), adōnāy, and Iehovah from Medieval Latin. In the rest of the universe, people live for thirty to forty thousand years with the intent of making their ascension to the next highest dimensional realm in that time frame. Reincarnation is a process reserved for those who have been killed in one way or another, and therefore require a new body with which to continue their evolutionary journey. 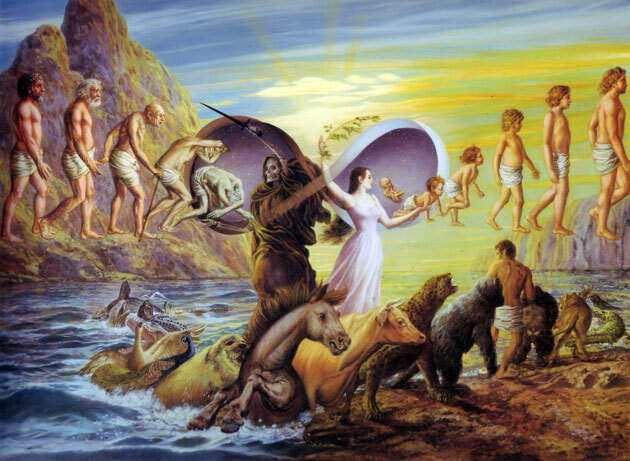 Reincarnation also serves a purpose for those brand new Souls who must evolve gradually through the various species of a world, so that they may eventually gain the experience required for human embodiment. Our living, dynamic universe is made up of countless intelligences that constitute manifestations of the Sound and Light. Everything is alive, then, and everything is intelligent – even the cells of our physical bodies; each one is an intelligence. Each intelligence moves gradually, up through the mineral kingdom, the plant kingdom, the insect and animal kingdoms, and then finally takes on human form when it becomes capable of dealing with the complexities of the human mind and brain. Scientific instruments are not yet sensitive enough to pick up levels of consciousness associated with the mineral kingdom, but they have proven in numerous studies, that plants possess not only consciousness, but also emotion and discernment. It is only an arrogant and very egotistical nature that believes humans to be the only life forms capable of evolution in a world based on the evolutionary principle. Certainly, blades of grass do not turn into humans; but over a period of millions of years, a single intelligence with personal awareness established by its particular vibratory harmony to the Sound Current, gradually gains experience, and eventually incarnates into higher and higher life forms. In fact, we can often tell when an individual is experiencing his or her first incarnation in human form. All parents are amazed by the unique personalities displayed by their infant children. We know that their brains are brand new, so it’s obvious that there could be no present-life experiences from which such personalities could have been developed. Some children possess unexplainable fears of such things as loud noises, water, fire, heights, etc., while others seem to pay little or no attention to these things. We come into this life with our own fears, affections, and behavioral propensities formed by an accumulation of past incarnations, and then these are subject to modification by our present life experiences. In this way, we can either progress or retrogress. The choice is ours, and it is made by all the choices we make in life as we deal with our environment. It is now time to deal with a statement that I made above, regarding the fact that in this world, the process of reincarnation has become our trap. Due to Dominion’s manipulations, we live very short lives, only to die and be born again. In this way, we are not afforded the time required to develop the great wisdom that could otherwise be ours. In addition, we are pressured by a lack of time, to gain an education and earn a living, so that we can quickly raise a family, move into our twilight years, and then die. This affords us very little time with which to figure out even the true meaning of existence, let alone time to develop wisdom. Consequently, we end up believing that wisdom consists of having learned how to deal with the basics of physical life. Reincarnation, then, has become a cyclic process whereby we scramble feverishly to the next life, then the next and the next, constantly dealing with more and more karma in an endless attempt to learn the meaning of it all. We are like hamsters on a wheel in a cage. Many people, who have found paths to walk, tend toward the eternal optimist mentality. Please don’t misunderstand me on this issue; optimism is a virtue, especially considering our present circumstances. However, it is often very easy to ignore the severity of the situation while burying ourselves in our optimism. Certainly, those of us who find paths to walk can mitigate our circumstances by utilizing the process of reincarnation in this world as a series of stepping-stones to greater and greater spiritual heights. In fact, many people perceive reincarnation in exactly this way. They believe that it is a cyclic process whereby we are naturally and gradually brought through the evolutionary process of energetic, mental and spiritual development for the purpose of eventually transcending the material worlds of dualism. This is indeed, very optimistic outlook, especially when considered in light of the fact that the allotted karma that is heaped upon us could easily bury our development in a heap of chaos that would prevent our emergence onto a spiritual path in any incarnation in the near future. It is better that we find a path in this lifetime that will allow us to transcend these material worlds here and now, rather than wade our way through many more incarnations. I find the concept that “we are all evolving to the same ultimate destination in our own way”, to be way too optimistic. If it weren’t for the fact that we had many spiritual enemies awaiting us at every juncture, I might not feel this way. However, we do not live in a part of the universe where our evolutionary processes are natural and without manipulations. For this reason, the spiritual path that leads to transcendence of the material worlds is a very difficult path indeed. Without the Avalokita and our strict adherence to his or her guidance every step of the way, we will become lost in the many traps that await us. We must, without fail, transcend reincarnation, as it exists in this world and eventually embrace reincarnation, as it exists in the rest of the universe.